The Repentance Hall is on the ground floor to the right as one leaves the Dining Hall. Shoes are placed on the shoe shelf outside the shrine. Dharma services are held here on Sunday mornings. Members of the public are welcome to attend. Repentance is a very important concept in Buddhism, differing somewhat from the Western concept of “confession”. It involves understanding that our wrong or “unwholesome” actions are a result of ignorance. Repenting, we promise to stop doing the things that cause pain and to do things that benefit others and ourselves. The practice of repentance often involves prostration. This is not idol worship but the remembrance of our teacher, Sakyamuni Buddha and the recognition that we too, have a pure Buddha mind. 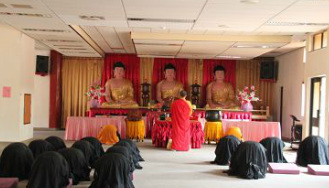 There are four shrines in the Repentance Hall: the Sakyamuni Buddha Shrine, the Medicine Buddha Shrine, the Kshitigarba Bodhisattva Shrine and the Kuan-yin Bodhisattva Shrine. The main shrine is the Sakyamuni Buddha Shrine on which are three large figures representing Sakyamuni Buddha, the most important Buddha in the Repentance Hall, in the centre, Amitabha Buddha of the Western Pure Land, on the left and Medicine Buddha, on the right. The physical features of the three Buddhas are the same. The mudras, or posture of the hands distinguishes them. Amitabha Buddha holds the lotus flower signifying the Land of Ultimate Bliss. Sakyamuni Buddha’s hands are in the mudra of meditation while the medicine Buddha holds a round crystal jewel indicating his healing powers. The monk who leads the service sits on the ornate throne in front of the Buddhas. Sakyamuni Buddha was born 2600 year ago in northern India to Warrior King Suddhodana Gotama and his wife, Maya. When he was an infant it was predicted that he would become either a great king or a world-changing spiritual leader. The prince, Siddhartha, led a protected and luxurious life. He was an exceptionally kind, gentle and gifted student. Shortly after he married, he encountered, for the first time, sickness, old age, death and the aesthetic life These experiences changed his life. He decided to abandon his life of excessive luxury and resolved to find a way to alleviate human suffering. At the age of twenty-nine he left his palace and set off as a wondering monk, on his search for truth. For six years he studied with the greatest spiritual teachers of the time trying to find a way to end suffering. He practiced such extreme austerities that he became ill and emaciated but still had not achieved enlightenment. Finally he abandoned all extremes. Sitting under the famous Bodhi Tree, he resolved not to get up until he had become enlightened. There he achieved liberation becoming a Buddha or awakened one. He spent the next forty-five years of his life teaching the Dharma or Truth and the method to end suffering and attain perfect bliss. Amitabha, meaning infinite life and infinite light, has been described as “the archetype of cosmic compassion”. He is the central figure of the Pure Land School of Buddhism, presiding over the Western Pure Land or Land of Ultimate Bliss, where anyone can be reborn through utterly sincere recitation of his name. Having attained the Pure Land, even ordinary mortals, burdened with painful karma, can achieve liberation, safe in an environment free of negative distractions and temptations. Opposite the shrine of Sakyamuni Buddha is the shrine of the Medicine Buddha who reigns over the Pure Lapis Lazuli Paradise in the East. He heals the ills of body and spirit including that of ignorance. Above the shrine, on red cards, are the names of people who are physically or mentally ill. Their names are placed here in order to receive the blessings of Medicine Buddha. Buddhists believe that the merit or compassionate energy of those praying to the Medicine Buddha will help cure those who are ill.
To the right of the Medicine Buddha shrine is the Kshitigarba or Earth Store Bodhisattva Shrine. Kshitigarba is usually represented standing, holding in his right hand a pilgrim’s staff and in his left a pearl. His head is either shaved or he wears a crown. Like all Bodhisattvas, he aspires to deliver all sentient beings from their miseries but he specializes in liberating beings suffering in the hell realms. He vowed, “Not until the hells are emptied will I become a Buddha.” With inconceivable compassion, he takes upon himself the fearful task not merely of bringing relief and consolation to those in torment, but of personally transforming and uplifting the vast inchoate mass of fear, hatred and despair in the hells. He is the supreme embodiment of spiritual optimism, which wills that not so much as a grain of dust should be left outside the scheme of salvation. Around the shrine are yellow cards bearing the names of deceased loved ones. Their families are praying for them and asking Kshitigarba to help them.